On Tuesday we helped our friends at DoubleDutch put on a panel discussing what’s next in marketing technology and how startups can capitalize on the skyrocketing CMO tech budget. 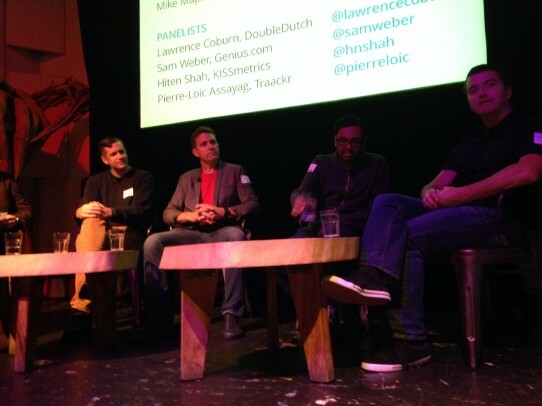 The event was called “The Battle for the Marketing Cloud,” and it was a hit! CEOs from DoubleDutch (social events platform), KISSmetrics (data analytics), Traackr (influencer marketing) and Genius.com (marketing automation) spoke to a packed house of startup founders with insightful moderator Mike Maples, one of the valley’s top notch VC’s and managing partner at FLOODGATE. 1) The “shift” in budget from the CIO to the CMO is not really a shift. Since Gartner predicted that the CMO’s tech budget will eclipse the CIO’s by 2017, there has been a lot of hullabaloo about these two positions competing for cash. In reality, that’s not the case. CIO’s aren’t losing money for tech to their colleagues in marketing; CMOs are just rapidly gaining budget because new digital tools are making it easier for them to prove ROI on their spends. A classic marketing problem used to be, “I know half of my advertising budget is working, I just don’t know which half.” Trackable, data-driven tools are increasing transparency into what channels and messages work. Hence, the boom in enterprise marketing-focused startups. (Credit: Mike Maples, @m2jr). 2) Cloud software is democratizing the marketing vendor space. 3) Complex marketing sales require buy-in from the CIO. 4) Integrating point-based marketing solutions is the next big opportunity. Because the cloud has created a boom in point-based solutions that focus on solving one marketing problem elegantly, marketers are usually dealing with a number of tools that don’t talk to each other. The next wave of truly “disruptive” solutions will integrate data from all tools – social, automation, email, events and more – into one easy-to-understand platform. This new solution would empower marketers to understand how their channels work together with powerful data visualization. (Credit: Pierre-Loic Assayag, @pierreloic and Sam Weber, @SamWeber). 5) The best companies don’t compete. Mike Maples had so many insights about what makes a startup remarkable, it was hard to choose just one to highlight. However, my top takeaway from Mike is that the best companies don’t compete at all. They are not trying to be the best in their category; they create categories. In this position, a company should develop a provocative point of view that repels those “villains” who you would rather not have as customers and attracts others that share your spirit. For example, Salesforce ran with the “no software” perspective that drove away slow-moving traditional sales departments and excited those looking for a less clunky CRM service. A big thank you to DoubleDutch for sponsoring the event and to Mike Maples, Lawrence Coburn, Hiten Shah, Pierre-Loic Assayag and Sam Weber for participating. You can continue the discussion by downloading the DoubleDutch event app here or tweeting me @DianaHSmith.